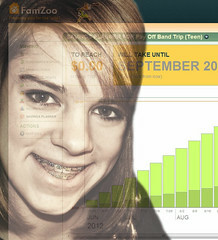 Carissa is grappling with the perfect teen financial storm: movies, mascara, shoes, and...the $450 band trip — all of which her 14 year old daughter promises to pay back. Honest! Really? How’s her daughter going to earn all that money? The answer: selling “crappy” chocolate, toiling through items on the “Ask Dad” list (I suspect cleverly re-purposed by Papa Rogers from the honey do list), detailing the family wagon, and eternal babysitting duty. Read the clever details here. Sounds like a thoughtful plan. But how do you know when “pay-back day” finally arrives? 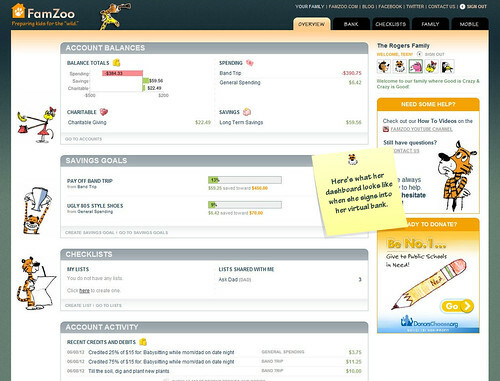 How to you track all those earnings, purchases, and IOUs with minimal fuss? 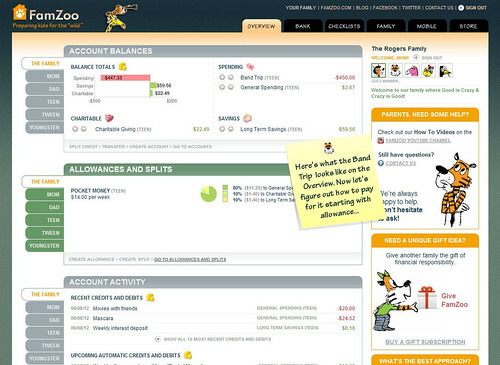 The answer: set up a virtual family bank — the “Bank of Rogers” in this case. 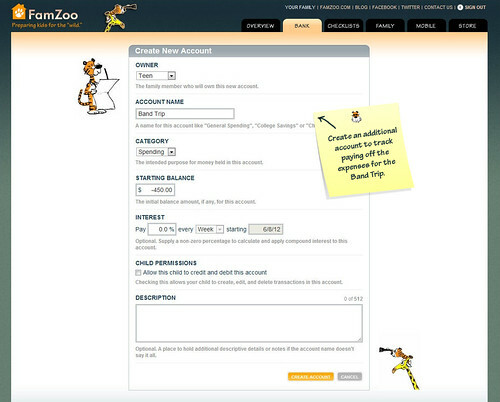 Here’s how we set up the “Bank of Rogers” on FamZoo. First, let’s assume that before the perfect storm hit, the Rogers’ daughter was cruising along covering her “wants” with one of our typical default setups: the classic “Pocket Money” allowance split between spending, saving, and giving. 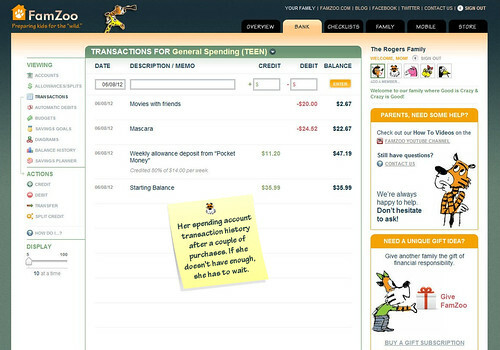 Everyday “wants” (or “needs” if your frontal lobe is of the teen variety), come out of her daughter’s General Spending account. 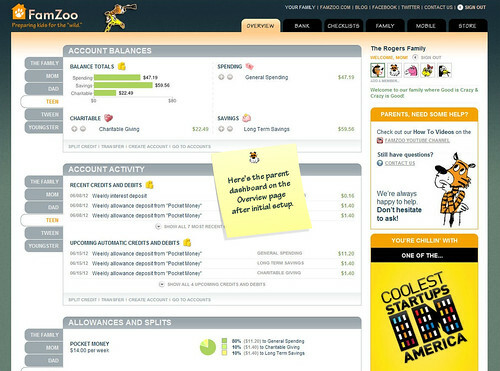 Parent and daughter can track the automatic allowance deposits, the purchases, and the running balance in the account transaction history. Here’s what it might look like after movies and mascara. Nope! Your daughter can’t afford those $70 shoes just yet. 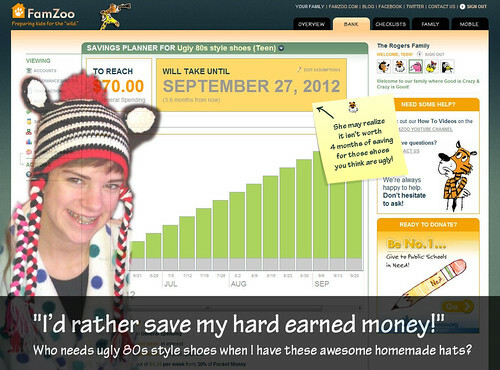 She can create a savings goal for the shoes, and use the Savings Planner to see how long it will take to afford them. Looks like it will take just over one and a half months if she saves all of the spending portion of her allowance from here on out. She’ll just have to wait. What About the $450 Band Trip? Now this one’s a bit different from the shoes. Carissa probably had to make the payment up front for the trip, but her daughter doesn’t have enough money in her General Spending account to pay her Mom back right away. Now what? How’s She Going to Pay for This? 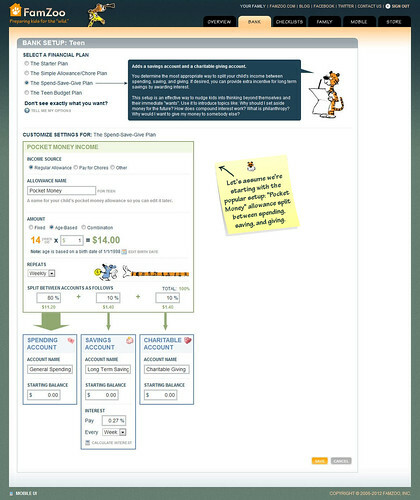 Adjust the split percentages to put some portion of her weekly allowance toward paying off the trip. That means less money will go towards “wants” — like movies, mascara, and new shoes — until the trip is paid off. 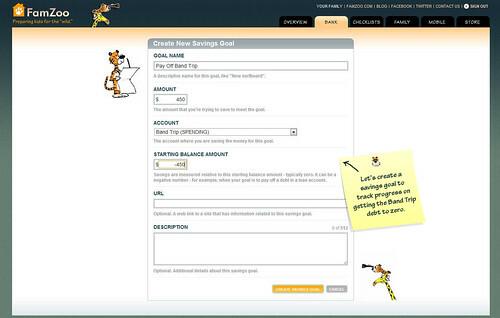 To see just how long this sacrifice will last, navigate to the Savings Goals page on the Bank tab and click on the Create link. 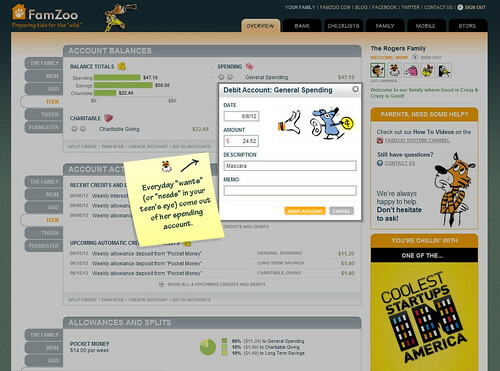 Fill in the fields to create a goal that will track progress towards paying off the debt. 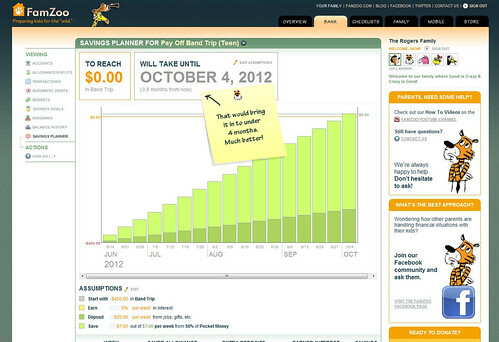 I.e., it will track the balance in the Band Trip account as it goes from -$450 to $0. 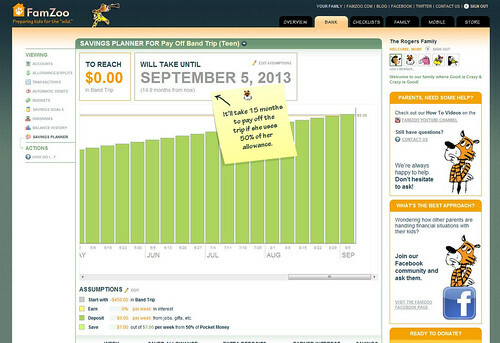 Visit the Savings Planner page on the Bank tab to see how long it will take to pay back the IOU. If she allocates 50% of her allowance each week, it will take over a year. Ouch! What if she’s able to earn an extra $20 per week on top of that? 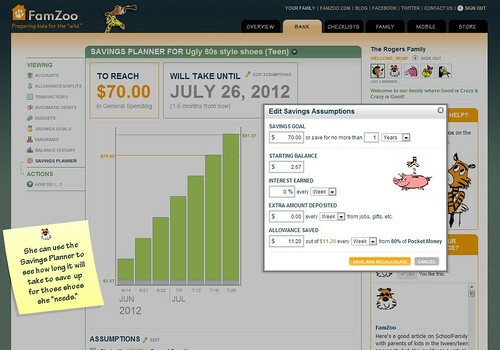 Editing the assumptions accordingly in the Savings Planner, we can see that would pull it in to under 4 months. Much better! Where’s She Going to Get That Extra Money? So where’s that extra money going to come from each week? Odd jobs around the house. Dad would be more than happy to offload some items that have been lounging on his honey do list. 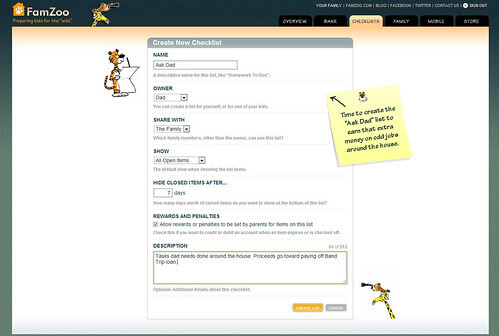 So, he visits the Checklist tab and clicks on the Create link to create the “Ask Dad” task list. 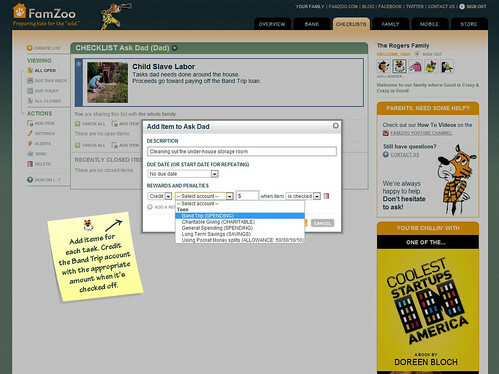 Then he clicks on the Add Item link to pop tasks on the list. Each has an appropriate reward that is automatically credited to the Band Trip account when checked off. 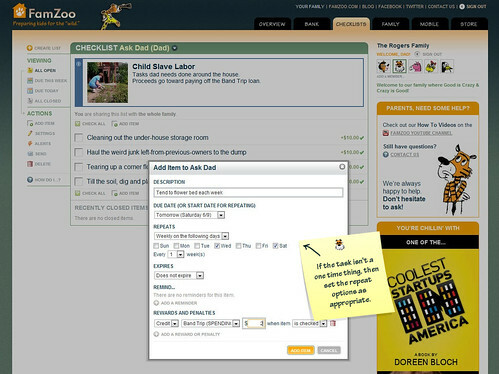 If the task is more than a one-time deal, he can fill in the repeat options as appropriate. 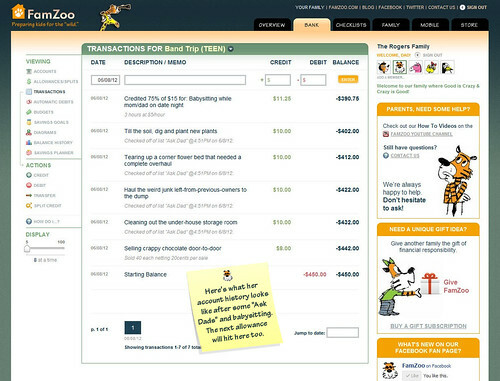 Then, whenever she needs to make a babysitting payment, she can credit both accounts at once. 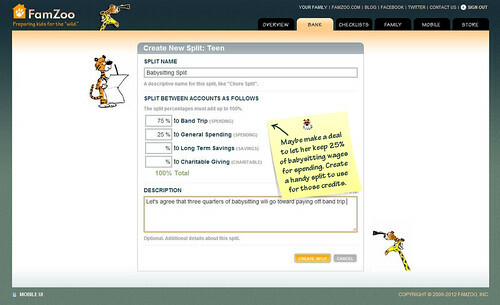 Just click on a Split Credit link on the Overview or Bank tab, enter the total amount, and select the Babysitting Split. 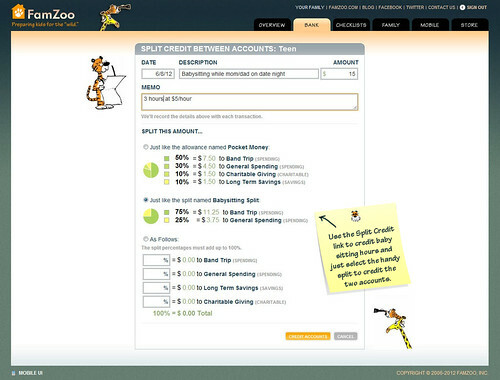 The total amount will be automatically split between the two accounts in the right proportion. But, the really big picture comes into play when the daughter reaches the pay-off moment. 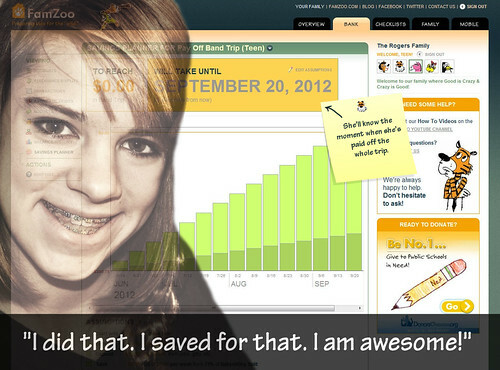 Paying off a $450 band trip is a tremendous accomplishment for a 14 year old. It takes discipline, and it’s undeniably something to be proud of. And, who knows? There may be an epiphany or two along the way when it comes to spending and priorities. Bonus! Yes, Mom, you can dream! 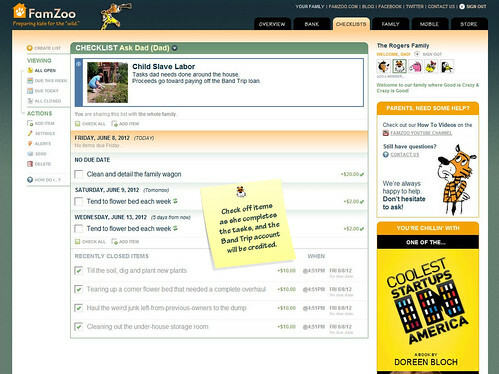 This looks like a great tool and much more sophisticated then the jobchart.com app I've been using. My son has $500 to earn for his Scout Jamboree trip exactly one year from now, so this would be a great way for him to see that goal as more of a reality. 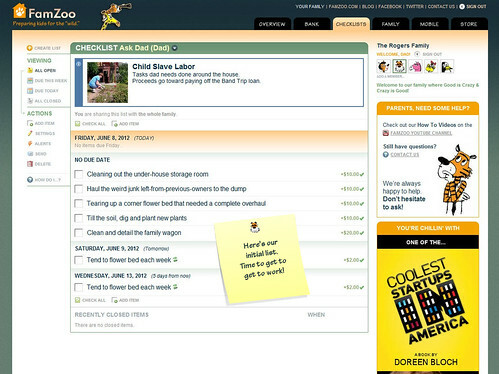 And seriously, I need some good tools in the eternal teen chore wars. After so many years of raising boys (this is my last one - whew! 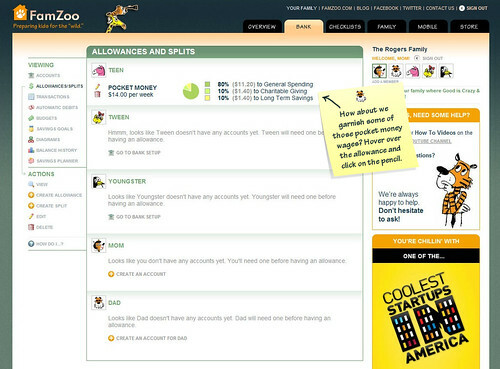 ), Mama just gets tired of fighting the same ol' fights. Kudos to you and your boys on that front. It will indeed pay off handsomely. P.S. 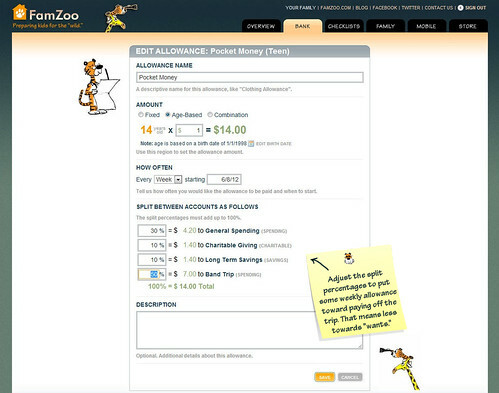 Like the zebra stripe theme on your blog - fits well with our zoo theme!